This 70W80 GL-4 Gear Oil (SAE 5W30/10W30 engine oil viscosity) is designed for use in manual transmissions and transaxles. Provides excellent protection of gears and synchronizers and its balanced slipperiness provides a perfect coefficient of friction, allowing easier shifting. 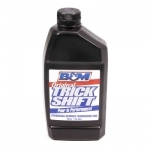 Popular in many BMW transmissions and in most Honda and Acura transaxle applications.